Julian Aguon is an indigenous Chamoru writer-activist, attorney who specializes in international law and is the author of numerous books and law journal articles on the subjects of self-determination, human rights, indigeneity, colonialism, and militarism. 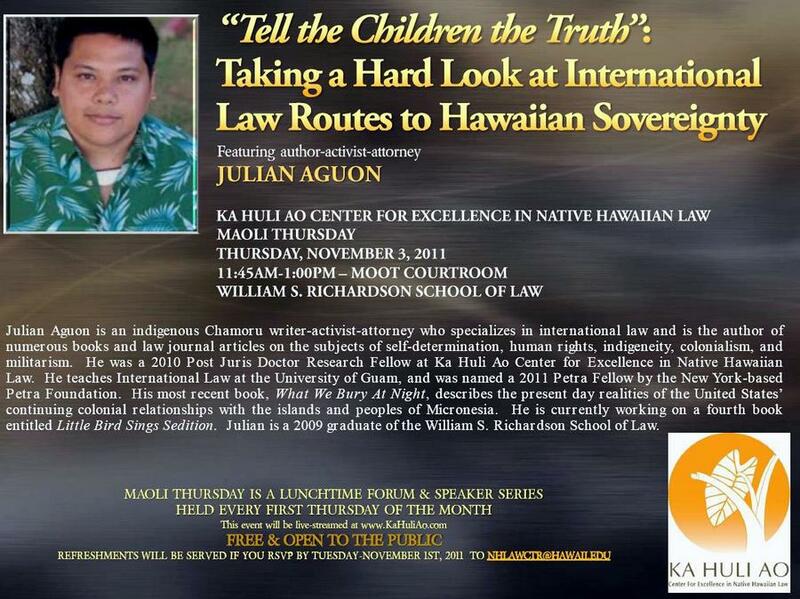 He was a 2010 Post Juris Doctor Research Fellow at Ka Huli Ao Center for Excellence in Native Hawaiian Law. He teaches International Law at the University of Guam, and was named a 2011 Petra Fellow by the New York-based Petra Foundation. His most recent book, What We Bury at Night, describes the present day realities of the United States’ continuing colonial relationships with the islands and peoples of Micronesia. He is currently working on a fourth book entitled Little Bird Sings Sedition. Julian is a 2009 graduate of the William S. Richardson School of Law. 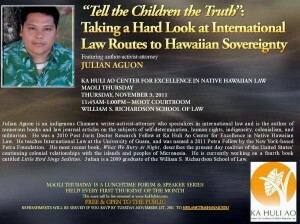 Maoli Thursday is a lunchtime forum and speaker series held every first Thursday of the month.